This is a guest post by Vern Marker. If you'd like to guest post on this blog, click here. Conflicts are a part of everyday life, but they can wreak havoc on your career, your marriage, and your personal relationships unless you develop the ability to resolve them. Conflict resolution isn't magic especially when you are in a relationship. Here are a few tips that will aid you in arriving at a solution that makes everyone happy. 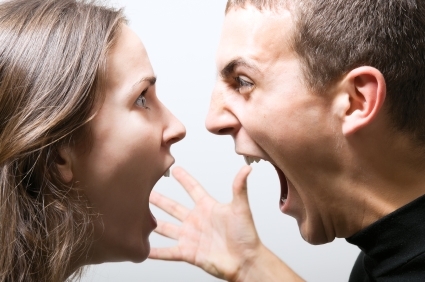 When an argument gets heated, the chances of finding an easy resolution are slim to none. Even a logical compromise that you would both think of in a calmer state of mind can be elusive if you are both upset or angry. Your best bet is to agree to talk about the problem when you have both calmed down. Then go do something to get your mind off the argument. Spend some time apart to give yourselves a chance to cool off, and if possible, revisit the problem the next day. Also, it may sound like your mother's advice, but get a good night's rest. Something that seems extremely upsetting at the time often feels downright bearable the morning after. 2. Listen to both sides. When you revisit the problem with a calmer frame of mind, it is important to make sure that you both listen to one another and give each other a chance to explain your side — otherwise you will both just get upset all over again. This means that you both have to agree to do an equal share of speaking and listening, not interrupt one another, and to respect what the other person has to say. Part of talking it out is making sure that you phrase things in a way that won't place blame on the other person, which will undoubtedly put them on the defensive and make them angry. Focus your statements on yourself and how you feel, instead of the other person and what they've done (whether it's true or not). Think of these as “I” statements, and the finger-pointing sentences that you want to avoid as “you” statements. 3. Brainstorm to come up with solutions. Don't spend too much time hashing out both sides — as important as this is, if you start feeling like you are saying things over and over again, it's probably time to move on to finding a solution. This part needs to be done together, so start brainstorming! A resolution that comes from both of you will feel better and be more likely to satisfy everyone involved. Arriving at a resolution may take some trial and error, so don't get discouraged if at first it seems like you'll never get there. Also, remember that a resolution that is fair to both of you will probably require some compromise. Brainstorming means coming up with many suggestions, and gradually narrowing your focus as you begin to identify a solution that will work for both you. There are many other techniques that can be used in conflict resolution, but these are three of the most important. When you are both calm, dedicated to listening to one another, and willing to work together to find an acceptable solution for both of you, you will be able to resolve the argument faster, easier, and with less fighting. When we argue, everyone loses, but when we make the effort to compromise and resolve the conflict peacefully, everyone can walk out a winner. Vern Marker is a freelance writer who is pursuing a dispute resolution degree online. Who are the best people you know?